Mimi Kirchner has an Etsy shop! Yea! Did everyone but me already know that? 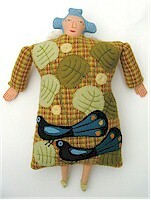 Mimi is a doll-making goddess. While I love every single thing she makes, I’m especially in love with her grandmother and fairy-grandmother dolls, like the one shown here. Her charming designs are a little bit edgy. Her construction is beautiful, and her embroidery is perfection. I wish I were Mimi Kirchner.